PR handlers during a pitch should be absolutely and completely silent. You are not the story. You’re forgetting that in many instances we (the PR folk you so frequently deride) are better at explaining to you what the story is and why it’s relevant to you and your readers and even perhaps be as bold as to point out an interesting story angle for you. Whereas the engineer or product manager that you’re meeting with is hung up on walking you through the product transistor by transistor. @Trish: he’s not forgetting that at all. The point is that during the pitch itself, the presenter must stand alone. The PR function is indeed important, much like a coach or manager to a baseball player. But during the moments when the player is swinging the bat, the coach can’t and shouldn’t be seen. @Ken: I guess I see the role more as a first base coach, who can be seen, and is a vital part of the game, suggesting to the player when to bunt, when to run and when to hold up. Sometimes he has a better view of the whole field and he can have valuable input. It doesn’t make the player’s role any less valuable and doesn’t negate the run he scores, but his role can be vital nonetheless. I agree with Rafe in that the PR person is not the story. And in instances where “the story” is indeed about the interviewee (e.g. 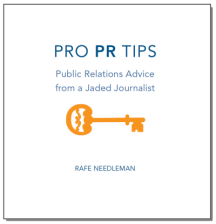 a profile piece) the PR person’s role is much more backseat than drivers seat, but when “the story” is about a product or service or even about a whole company, I see the PR person as a vital part of the team that the journalist is speaking with. I think if PR people step up and ensure they have in-depth knowledge about their products and services and know the journalist well (e.g. their story interests, the stories they’ve already covered etc.) and if the journalists step up and accept that PR people can add value and shoudn’t just sit in the corner unseen and unheard simply taking coffee orders, then collectively they can work together very successfully and not adversarily with a very good end result. On the other hand. If you are presenting to someone who is trying to let you know they want to focus on the product/service, then why interrupt that flow? The PR person’s function is to get to the place where the reviewer will agree to actively learn about the product/service. Once you are there, most of your job is over. If the reviewer has questions, or doesn’t understand something, you might offer to explain, but at that point the reviewer gets to decide. Sometimes, you just have to chime in. I’ve had plenty of instances where the presenter has either had langauge issues, or just forgotten some important item that they really should mention. Would you rather I chime in, or pass the presenter a note, which would at first blush look like we were trying to be sneaky? Agreed. I work in PR- once I set up the meeting, I let the spokesperson go. I wouldn’t be doing my job if I let him go on and I didn’t think he was prepared. That’s fine as long as you understand PR people and clients use IM all the time ;). I like the matchmaking role you describe. Its tough being “on” for an interview. Reporters do this for a living but spokespeople only do this a handful of times a year. its nerve racking to be on the spot. When I’m in a meeting with my spokesperson, my job is to keep them on message (which is all about prep beforehand) , but also, to keep them functioning. Sometimes you need to break in simply to give your person a chance to breathe and think about what they want to say next. Kind of like calling a time out. I agree though, in general, the PR person’s role is to be silent. I think that, as a PR person, we have to be at the sidelines, unheard yet available. That being said, we also must know when we are needed. We can only coach so-far, and if our client begins to loose track, we need to help them get their footing again. It is a bit disconcerting that a reporter would not want a knowledgeable representative to articulate a point when the spokesperson is having difficulty finding the right words. It seems to me that it would make said reporters job a little easier. Yes, a sp0kesperson should be prepared before the pitch. Yes, a PR person should ride the side-line, silently (unless it is clear the first base coach role is needed). But, the REAL reason I sit in the room is neither of these. It is for the rare, but real, ambush journalist who has lied about his or her angle, interest and background and is seeking to discredit my spokesperson, our product, and our agency. Then, you darn well bet I’m going to speak up. A lot.